Sullivan's Rice Root Mix Brush [MRS or MR] : Highland Livestock Supply, Ltd, Products for all of your show animals! 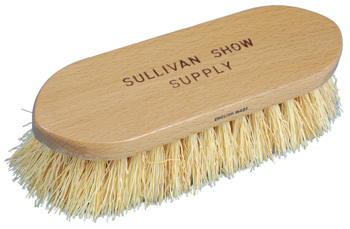 Sullivan's Rice Root Brushes have stronger bristles to be longer lasting and smooth wood handles for your comfort. Contains 1/2 rice roots and 1/2 synthetic bristles to help stand up to continuous use. Bristles are trimmed to 1 3/4" for long lasting firmness. We recommend that you do not soak your Sullivan's Rice Root Brushes, they are pre-soaked. Available in two sizes: Large 8" Long x 2 5/8" Wide - OR - Medium 7" Long x 2 1/2" Wide.